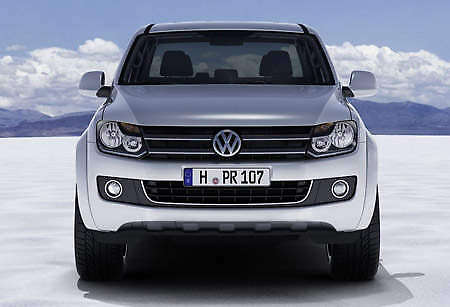 Volkswagen Amarok pick-up truck finally revealed! 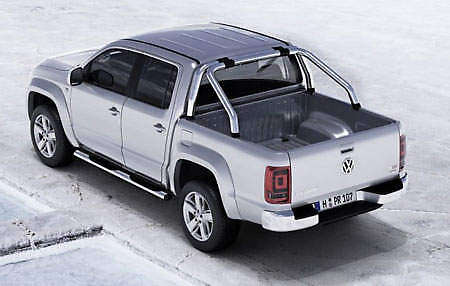 Home » International News » Volkswagen Amarok pick-up truck finally revealed! This has been teased for some time now, but Volkswagen have finally released pictures and details of its new pick-up truck. Called Amarok (a mythical killer wolf in Inuit), it will be available as a four-door double cab, with a single cab model to follow in 2011. With the Amarok, VW aims to blend the robustness typical of a pick-up with innovative technology, high safety standards, excellent fuel economy and Wolfsburg’s lofty standards of comfort, quality and durability. I don’t know about you, but i’m itching to find out how this seemingly contrasting values mix – and if VW will rewrite the pick-up truck rule book. The fundamentals are conventional. The Amarok sits on a class standard ladder frame chassis and has a payload capacity of 1.15 tonnes (max towing limit is 2.8 tonnes). Its 5.25m length puts it on par with the Toyota Hilux, but the VW is claimed to have class leading cargo bed volume – the deck measures 1,555mm long and 1,620mm wide. As comparison, the Hilux’s measurements are 1,520mm by 1,515mm. VW further says that the width between the wheelarches (the narrowest point in the cargo bed) is best in class. There will be a choice of two Euro5 compliant 2.0-litre common rail TDI engines; one with 161bhp and 400Nm of torque from just 1,500 rpm (two-stage bi-turbo), or a 120bhp unit with 340Nm from 2,000rpm (variable turbine geometry turbo). Paired with a six-speed manual (the only announced gearbox), the VW will be the first 4WD pick-up in the class with CO2 emissions of less than 200g/km. Like the Transporter and Caravelle people carriers, the Amarok has a gearchange indicator to help drivers achieve the best fuel economy, which with an 80-litre fuel tank should offer a range of over 1000km! The Amarok can be had in RWD, switchable or permanent 4MOTION all-wheel drive variants. The switchable 4WD system is engaged by the push of a button, and also has low off-road gearing, while the full-time 4WD version (unique in this sector) uses a Torsen differential to distribute drive at a 40:60 ratio so that the wheel with the best traction gets the most power. VW’s electronic differential lock (EDL) and Off-Road ABS works in tandem to shorten braking distance in off-road conditions. Below 30km/h, Hill Descent Assist can be called upon and Hill Hold Assist prevents the truck from rolling back on inclines when the driver removes his foot from the brakes. A rear differential lock is optional for all three variants. Another best in class feature is the Amarok’s spacious interior, which features easy entry, foldable rear seats and a dashboard that’s immediately recognisable as a VW. Outside, the production Amarok retains much of the concept’s strong, clean and masculine lines – also, who would have thought that the new Volkswagen face could work so well on a butch pick-up truck? Production should start anytime soon in Argentina ahead of its worldwide launch early next year. South America will be the first market to get the new truck, followed by Europe and Australia. No mention of our region in the press statement though, which is surprising since ASEAN (especially Thailand) is a big market for pick-ups. The Amarok’s first public outing will be as a support vehicle in the Dakar rally this coming January. Previous Post: Volkswagen Up! Lite Concept features a TDI hybrid system, uses just 2.44 liters per 100km! Next Post: 2009 LA Show: Honda P-NUT concept is quite tasty!